Born on August 13, 1932 in a house facing the famous Parthasarathy temple in Madras, Vyjayantimala belonged to an orthodox Iyengar family from Mysore. Her mother, Vasundhara Devi was a renowned classical singer who had acted in some well-known movies in the 1940s. Vyjayantimala made her debut in the Tamil film Vazhkai in 1948. It was subsequently made in Telugu as Jeevitham (1950) and in Hindi as Bahar (1951). In a career spanning two decades, Vyjayantimala acted in many memorable films primarily in Hindi and Tamil. Though she also acted in a couple of Telugu movies, a Bengali movie (the National Award winning Hatey Bazarey (1967)) and a Kannada film. Vyjayantimala has three Filmfare Best Actress awards to her credit; She was awarded the Padmashri in 1968 (the year she quit films, while still at the top) and the Sangeet Natak Akademi award in 1982 for her contribution to Bharatanatyam. So, on her 83rd birthday, here are 10 of my favourite solo songs picturised on this dancer and actress par excellence in no particular order. 1) Saiyan dil mein aana re (Bahar, 1951, Shamshad Begum, S.D. Burman): This song is from her debut multi-lingual film, which was a super hit in all the three languages. She was the heroine in all the three movies. The movie had some wonderful songs sung by Shamshad Begum like Duniya ka maza le lo and O Pardesiya. This particular song is popular till date, with its remixes still doing the round. 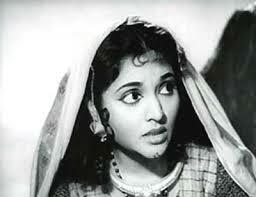 One of Shamshad Begum’s best known numbers, Vyjayantimala looks so very innocent and vivacious. 2) Jadugar Saiyan Chhodo mori baiyan (Nagin, 1954, Lata Mangeshkar, Hemant Kumar): When AVM had signed Vyjayantimala for Vazhkai, they insisted on an exclusive contract with them, which forbade her from signing any Tamil films outside their banner. They had not anticipated that she would click in the North as well. But after Bahar released, she got a flurry of proposals from Bombay. The first one she took up (based on the advice of her shrewd grandmother and father), was this movie. The reason for her signing this movie was the number of dance numbers. Nagin, released in 1954, clicked and how! It was the highest grossing movie of the year and all the eight solo songs (sung by Lata Mangeshkar) were super-duper hits. The ‘southern sensation’ was here to stay. In her memoir, she does mention that she was often irked and would be in tears during the entire shoot. The director would call her ‘idli’ and Pradeep Kumar ‘rasgulla”, much to the actors’ dislike. I was torn between Mera dil yeh pukare aaja and this one – the two songs I really like. But decided to go with the happier of the two songs. 3) Jise tu qubool kar le (Devdas, 1955, Lata Mangeshkar, S.D. Burman): When Bimal Roy wanted to sign Vyjayantimala for the role of Chandramukhi in his version of the Sarat Chandra classic, he was dissuaded by many in the industry, including his script writer Nabendu Ghosh. He says, “I did not approve of Vyjayanthimala [as Chandramukhi], but we had no option — no one wanted to play Chandramukhi, and we were committed to our distributors.” Others taunted Roy and were of the opinion that if he was to have Vyjayantimala play Chandramukhi, why doesn’t he sign Kishore Kumar as Devdas? For whatever reason, financial compulsions or just plain conviction, Bimal Roy persisted with Vyjayantimala as Chandramukhi and his decision paid off. 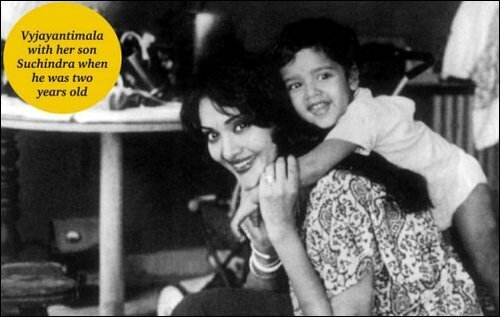 She won the Filmfare Best Supporting Actress award for her role – an award she refused to accept simply because she didn’t think hers was a supporting role, in any way of lesser importance than Suchitra Sen’s! This song is one of the two songs I like from this movie – the other being Aan milo aan milo shyam sanware, a lovely bhajan (in the Baul tradition) that has not been picturised on her. 4) Jao Jao nand ke lala (Rangoli, 1962, Lata Mangeshkar, Shankar-Jaikishen): Kishore Kumar and Vyjayantimala starred in a number of films together like Ladki (1953), Miss Mala (1954), New Delhi (1956), Aasha (1957) and Rangoli (1962). This song from Rangoli (1962) is one of my favourites, for a personal reason. It was a song I had danced to, in some semi-classical dance show, way back during my school days. Of course the choreography was slightly different – my dance teacher had made it even less filmy and more classical! 5) Zulmi sang aankh ladi (Madhumati, 1958, Lata Mangeshkar, Salil Choudhary): The years 1957 and 1958 were big years for Vyjayantimala. She replaced Madhubala in B.R. Chopra’s Naya Daur after the messy controversy. 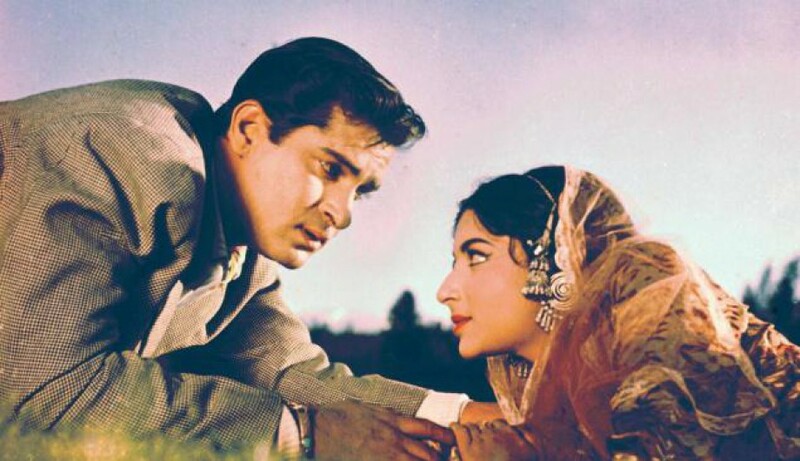 The film was a huge success and the Dilip Kumar-Vyjayantimala pairing became a hit pairing. In 1958, Bimal Roy signed her for his reincarnation saga Madhumati again opposite Dilip Kumar. Madhumati was a super duper blockbuster, becoming the highest grossing film of that year. This movie was a good showcase of both her dancing skills and her acting abilities, as she played three roles in it – Madhavi, Radha and the ghost Madhumati. 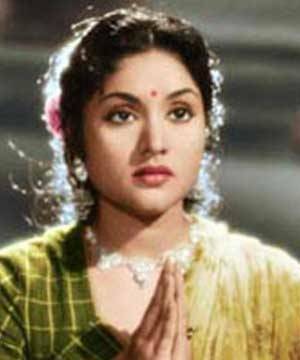 Madhumati is considered to be the first reincarnation saga in Hindi cinema, inspiring movies such as Milan (1967), Kudrat (1980), Karz (1982), and more recently Om Shanti Om (2007). Vyjayantimala was nominated for the Filmfare Best Actress award that year for this movie, but did not win. She won instead for her role in the B.R Chopra film Sadhna. The music of Madhumati remains as popular now as before. All the songs are delightful, so I was not sure which one to pick. I decided to stick to the first song I heard from this movie. 6) Aurat ne janam diya mardon ko (Sadhna, 1958, Lata Mangeshkar, N.Dutta): The B.R Chopra classic made in 1958 was Vyjayantimala’s show all the way. Playing a prostitute who turns into a defiant woman, she got ample scope to showcase her talents – both dancing and acting. Sunil Dutt (who else!) was the hero in this progressive woman-centric film. One of the big draws of this movie was Sahir Ludhianvi’s sublime poetry. Take for instance, this soul-stirring song on oppression of women (maybe a bit hackneyed). But Sahir’s lyrics are harsh and rather brutal, painting an unforgettable imagery. I chose this song, not only for the lyrics, but also for Vyjayantimala’s subdued dramatic acting. 7) Dhoondho dhoondho re saajna (Ganga Jamuna, 1961, Lata Mangeshkar, Naushad): This lovely song is from the film, Ganga Jamuna, in which she starred once again opposite Dilip Kumar and is said to have learnt Bhojpuri for this movie. She won her second Filmfare Best Actress Award and this movie is considered one of her best performances. This song is a lilting melody, exuberant and lively, it is about her lost ‘baala’ (earring), symbolising her innocence and even maidenhood. Vyjayantimala looks lovely in red. 8) Jaani tum toh dole (Dr. Vidya, 1962, Lata Mangeshkar, S.D. Burman): Another movie with some lovely songs such as Pawan diwani and Aye Hai dilruba. My favourite is this teasing, playful song, sung very melodiously by Lata Mangeshkar. Interestingly S.D. Burman uses the same folk tune that plays after the mukhda before the 1st and 3rd antara for O Panchchi Pyare (Bandini). 9) Mat ja mat ja mere bachpan (Chhoti si mulaqat, 1967, Asha Bhosle, Shankar-Jaikishen): This song is from a movie that Vyjayantimala made towards the end of her glorious film career. While I loved the Uttam Kumar -Vyjayantimala pairing – they both look gorgeous, I hated the glorification of child marriage and the whole ‘patni ka dharm‘ in this movie. The music by Shankar-Jaikishen is good, with some lovely songs like Jeevan ke do rahe pe and Tujhe dekha tujhe chaha. This peppy song sung melodiously by Asha Bhosle is one of my favourites. 10) Neel gagan ki chhaon mein (Amrapali, 1966, Lata Mangeshkar, Shankar-Jaikishen): Ending the list with a song from one of her best films. She put her heart and mind into this role. This film, however, was a huge flop and the failure of this movie is supposed to have disheartened Vyjayantimala so much that she soon called it a day. One of my favourite films – a historical period drama set in the Magadha empire, this has Vyjayantimala playing the famous courtesan from Vaishali, Amrapali. When I watched it way back in the eighties/ nineties on DD, I did not like it much due to a historical inaccuracy that bothered me quite a bit. The version that I knew, thanks to my Amar Chitra Katha reading, was that Bimbisara, the mighty king of Magadha lands up in Amrapali’s house (after being wounded in battle) and becomes Amrapali’s lover. She even has Bimbisara’s child. However in this movie, they show Ajatashatru, Bimbisara’s son played by Sunil Dutt as her lover. I remember being irritated about this when I watched it. 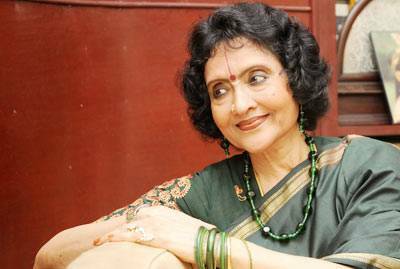 Here is this song that Vyjayantimala herself lists in her memoirs as being her favourite. Here is wishing Vyjayantimala ji many more happy and healthy years to come! Happy Birthday. This entry was posted in Old Hindi songs and tagged Amrapali, Asha Bhosle, B.R.Chopra, Bahar, Bimal Roy, Devdas, Dilip Kumar, Ganga Jamuna, Hatey Bazarey, Hema Malini, Hemant Kumar, Jeevitham, Kishore Kumar, Lata Mangeshkar, Madhumati, Nabendu Ghosh, Nagin, Naushad. Shankar-Jaikishen, New Delhi, Pradeep Kumar, Rangoli, S.D.Burman, Sadhna, Sahir Ludhianvi, Sunil Dutt, Uttam Kumar, Vasundhara Devi, Vazhkai, Vyjayantimala, Waheeda Rehman. Bookmark the permalink. I’ve been looking forward to this post ever since you mentioned that you’d be doing it, Harini! Lovely selection of songs (and yes, I was glad to see two of my favourite Vyjyanthimala songs – Mat jaa mat jaa mat jaa mere bachpan naadaan and Aurat ne janam diya mardon ko – in your list!). You’ve pretty much mentioned every other song of hers that I like a lot, from Jeevan ke doraahe pe khade to Tumhe yaad karte-karte, but here’s another one I like: Rulaaka gaya sapna mera, the last song written by Shailendra. Thank you. Madhu. 🙂 Mat jaa mat jaa is such a lovely song – sung beautifully by Asha Bhosle, no? Aurat ne janam diya mardon ko is one of my favourites too – but thats more I think because of Sahir’s poetry. I like Rula ke gaya sapna too – more than Hothon pe baat. It was on my shortlist but got dropped in the final list. I’ve a post on Vyjayanthimala in my Drafts folder (though it’s been sitting there for a long time), but it is not on her songs. She did have some wonderful songs picturised on her didn’t she? I’d reviewed both Nagin and Amrapali, and when I was reading your list, I was thinking she had quite a few films which focused on her, even if there was a hero. I loved most of the songs on your list; my particular favourites being Saiyyan dil mein aana re, Aurat ne janam diya mardon ko, Zulmi sang aankh ladi and Dhoondo dhoondo re saajna. Oh yes, Vyjayantimala had quite a few films focused on her – She mentions in her memoirs that her grandmother and her father were the ones who had story sessions with producers and directors and who decided which ones she would sign. So they did ensure that she had meaty roles in most of her films. My favourite from Amrapali is Jao re jogi tum jao re, but I just could not find the video (if it ever was picturised, that is… though I have a vague recollection of watching a video…) Though all the four songs are simply superb. And yes, the Kathputli song – one of my favourites too – which was pushed by Dhoondho Dhoondho re saajna in the final list. Thank you, Anu for reading and commenting 🙂 Btw, whats the post in your drafts folder about? A movie review? No, not a movie review. 🙂 She’s part of my ‘Greats’ category. So, a whole lot of mini-reviews. Jao re jogi never there in the film. I wish there was a video; in this Internet age, I assume if there was one, some enterprising soul would have uploaded it. I don’t even know if they picturised it, and then edited it out, or whether the song was composed for the film and then never used. It’s sad, isn’t it? Aah, interesting. Your blog has so many sections – unfortunately I do not have the time to read all the old posts. So it was not in the film. True, thats what I thought – if it was there it should have been up. Sad, its a beautiful song – it would have been nice if it had been picturised. Lovely songs. I was so glad to see the Devdas song on the list. It is one of my big favorites. Thank you, Ava.. 🙂 That song is one of the two songs I like in that movie. Thanks, Shilpi. Yes you have visited this blog before when Madhu directed you here. 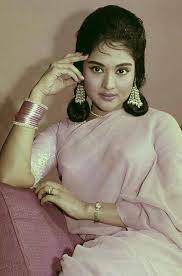 Vyjayantimala was indeed a wonderful dancer and a good actress.